Whether you prefer an easy-drinking ale or crave for the more adventurous beers with explosive flavors, you’ll find something in our 20 available taps that you’ll absolutely love. You see… we create our beer with a single mission in mind: To make beer that satisfies your craving for unique beer that you’ll from enjoy the first sip to the last drop. 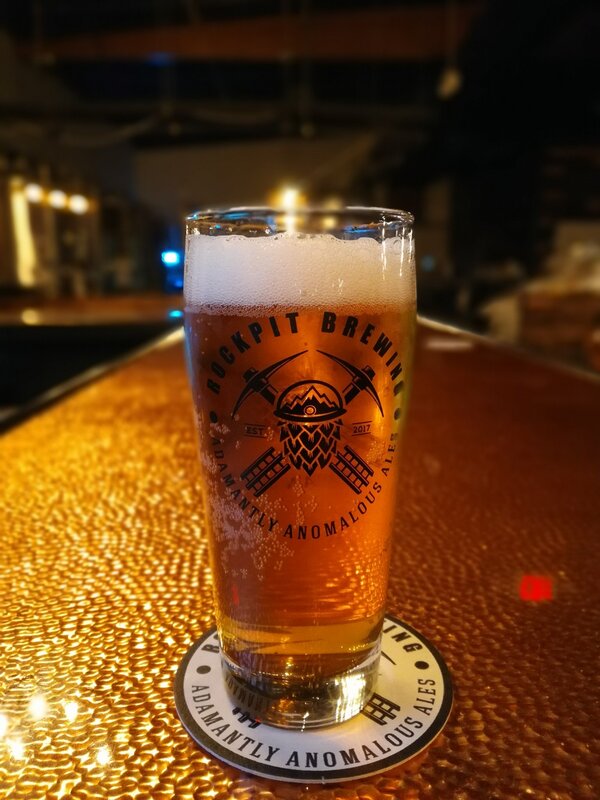 Ultimately you’ll find beer in our brewery that you can cozy up to, relax with a few friends or family and enjoy your escape from everyday life. The beers below are beers we have on tap now or have had on tap at some point. 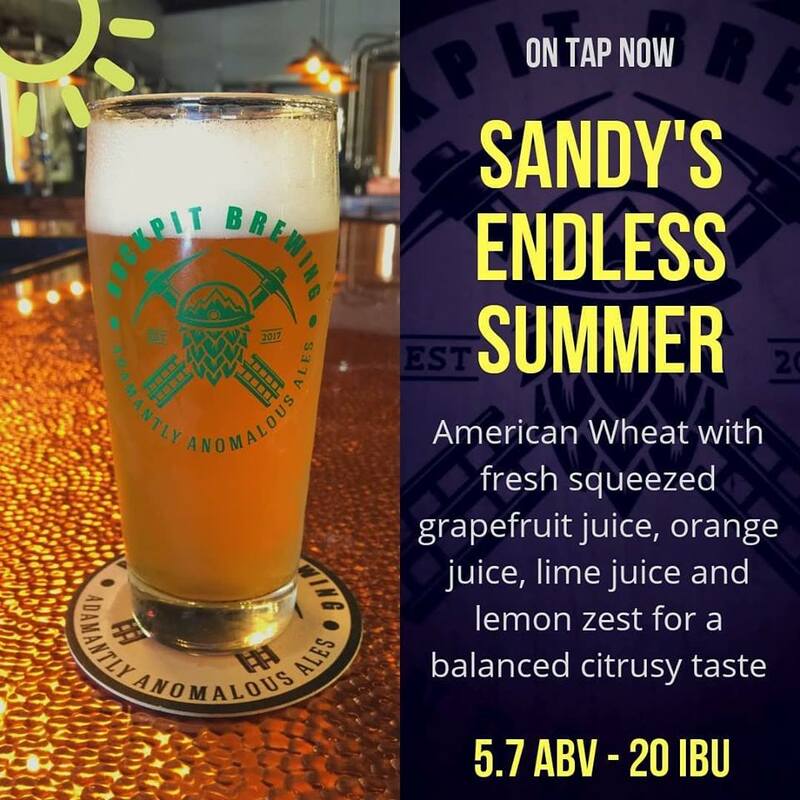 Starting with an exceptional wheat beer we added just the right amount of freshly squeezed grapefruit, orange and lime juice and topped it off with the zest of lemon. The result? An extremely enjoyable wheat beer with a citrus tang. 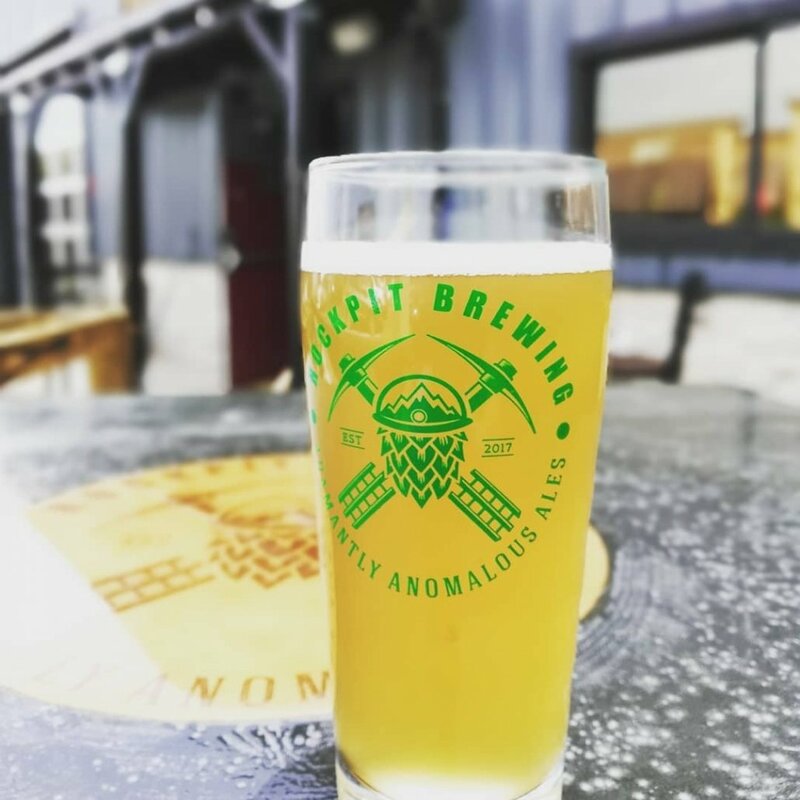 Fun fact: Sandy is Jeremy’s (co-founder of Rockpit) aunt and was pivotal in coming up with ideas like the coal wall and spent countless hours helping us build the brewery along with bringing dozens of friends in to help too. Our signature gose recipe aged with St. Augustine Gin-soaked oak and lime zest. This one is tart and sour with a side of tart and sour! Fun fact: This beer inspired another local brewery to start making sours after one of the partners tasted it and demanded they starting making them. Well… demand is a strong word. They “encouraged” the other partner. We won’t mention any names. Fun fact: The reason this beer is called “It’s Complicated” is in reference to the popular emoji used to communicate “It’s complicated” when someone asks about a relationship status. Get it? “It’s complicated”? Like damn Todd… just commit to her already. And to be totally transparent, we had a really hard time coming up with a name for a pineapple cedar berliner so “It’s Complicated” is it. This has SUPER LIMITED availability. What happens when we treat our signature berliner weisse with lactose then age it to perfection on a bed of mango puree and fresh vanilla? 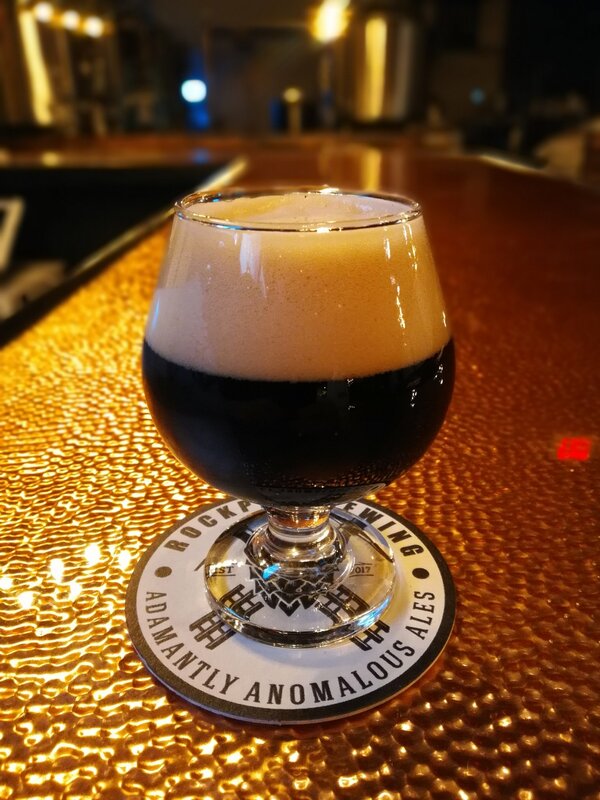 An anomalous explosion of flavor flying from your glass. Fun fact: This beer is a take on the Lassi drink that’s popular in Indian cuisine. Our brewer Danny had a Mango Lassi drink and thought “Hey, I can make a beer like this”. And he sure as hell did. This Calamansi berliner weisse is bright, crisp and totally sour – Aged with Calamansi lemons to deliver a “sour orange” or “sweet lemon” flavor. Again… This is super tart. Just to make that clear. Fun fact: Canatuan is a mine located in the Philippines near where Calamansi fruit is grown. Calamansi fruit is native to the Philippines and resembles a mix of lemon and lime. A Double New England Style IPA a.k.a Hazy IPA that’s a total “hop soup”. It’s a full bodied IPA with just enough haze to remind us where the NEIPA style comes from. And enough ABV to make it wicked strong. We’re really sorry about the use of wicked here. We’re brewers. Not “come up with name’rs”. Fun fact: “Underground Savage” is what others referred to miners who went into the deepest mines. In other words, they weren’t “Cacklers” at all. Medium-light in body with crisp, clean upfront bitterness. You’ll want to take time to savor the strong tropical and citrus notes that are prevalent in this all-american IPA. Fun fact: A “Cackler” is what they called a miner who let others do the heavy work. Sort of like Derek Zoolander (Click for video). A chocolate mint peppermint porter that’s minty fresh with a solid chocolate finish. We missed this at Christmas, but what the heck – Florida only has 10 days of winter anyways! Fun fact: We used real mint leaves in this beer. We only used 8 oz of dried mint leaves to flavor 5 barrels of beer. The scaled up recipe called for triple that. That would have been bad. Like chewing 10 altoids at once bad. Luckily the 8 oz was the PERFECT amount. A beautifully balanced imperial golden stout aged with toasted coconut, ghana cocoa nibs, coffee and vanilla. You’ll have the sads when the last drop hits your tongue. Fun fact: There isn’t any actual gold in this beer. That would be stupid expensive. This coffee milk stout is smooth and silky with roasted coffee tones and a creamy finish. So easy drinking, yet totally anomalous. Fun fact: Black strap is what miners called coffee. It’s also what they called the oil that went into their oil lamps in the early 1900’s. Which makes us think a lot of miners drank really bad coffee. Luckily we used a VERY good coffee in this beer which you’ll absolutely appreciate when that first sip hits your tongue. Oh and “con leche” is spanish for “with milk”. This beer has nothing to do with Spanish culture but we couldn’t think of anything better to use. “With Milk” doesn’t look or sound cool at all. “Con Leche” looks and sound really cool. Go on… Say it… “con leche”. Now say it with a Spanish accent. You feel cool, right? Our RPB house blonde that’s easy drinking with a light, crisp finish. You might even notice a slight fruity note in the first few sips. Fun fact: Blondin’s are aerial ropeways used in open pits in slate quarries to transport wagons loads of rock between locations. Side note: Apparently it’s illegal to ride a blondin in an abandoned mining area. Wish they would have told me that before the authorities were alerted.